The Beauty of Life: Fashion Question: Do You Change Your Bag To Match Your Outfit? Fashion Question: Do You Change Your Bag To Match Your Outfit? Above is a picture of my actual bag. Can you believe I actually move most of that stuff around from bag to bag on an almost daily basis so my bag matches my outfit? How about you? Do you change your bag to match your outfit? Let me know in the comments! I do! I'm not very into clothes, they are all basic and pretty plain, but I am all about the bags and always make sure they look cute with my outfit! Also, I have so many that I need to get use out of them to not feel guilty for all the money I spend. 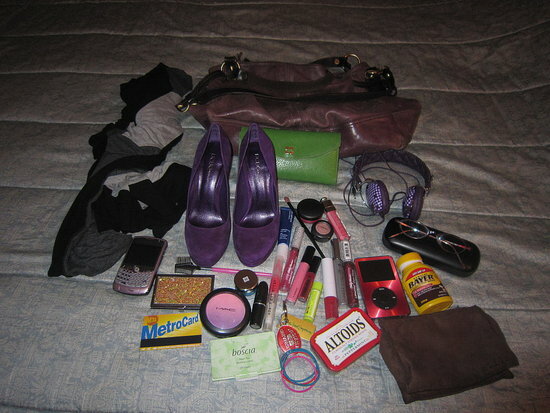 Constantly changing bags means I often forget to move things and am always without something I need or want though. No. I've been carrying the same metallic pewter hobo for 2 months. It goes with EVERYTHING. Then I'll change my bag for 5 days in a row, but I'll have to stop 'cause that's all the bags I have! I don't change bags. I have a bright colored Coach bag for the summer and I'm currently looking for a good quality chocolate brown bag for the fall/winter. I think if I changed bags all the time I would probably get very disorganized. I admire those like you that can do it!! !